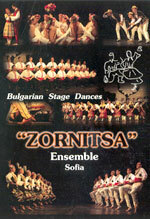 The DVD includes 12 dances of all ethnographic regions of Bulgaria performed by Zornitsa students’ folklore ensemble from Sofia with artistic director Emil Genov. The recording was made on 15 December 2007 at the concert on the occasion of the 25th anniversary of the ensemble in the Army Theatre in Sofia. 1 On Dobrudzha fields 12'05"
3 Girl's Spring Dance 6'43"
5 The Comitadji's Beloved 6'49"
7 Three Shoppes - Three Buffoons 4'55"
8 Women's Shoppian Dance 4'54"
11 Plays of Vidin 6'11"